We can’t legally tell you that there are elves who will do all the tough stuff for you inside every box. But when you load Office onto your Mac and see what it can do for you–from creating beautiful documents and compelling presentations to managing and sharing your information–it’s hard to believe there isn’t a little bit of magic going on in there. With up to 25% off there never been a better time to believe. 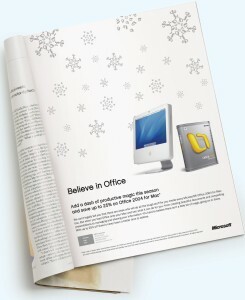 Note: The line “Believe in Office” was also used in online advertising, on t-shirts, point-of-purchase displays, mugs, pencils – basically anywhere they could think to put it (although of course it’s getting the line about the elves through MS legal that I’m most proud of actually).